Lavender calms, relaxes, and balances emotions. One way to use it is in a mister, add 5 to 10 drops of the essential oil to one ounce of water and spray pillows and sheets for a good night's sleep. Some aromatherapy uses of Lavender Oil include: headache, depression, stress, insomnia, muscular and joint pain, menstrual pain, digestive problems, nausea, colds and flu, athlete's foot, cuts and wounds, burns, sunburn, insect bites, acne, eczema, dermatitis. Note: Consult a book on aromatherapy for specific instructions on using this oil. Nature's Alchemy high-quality oils contain no ­chemical solvents, alcohol or extenders. Uses for essential oils include massage, aromatherapy, personal fragrance, facial steam, body care, inhalation, crafts, culinary, and environmental uses. Caution: Essential oils are highly concentrated and should always be used with care and in small quantities. 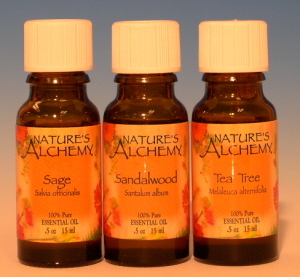 Read about the properties and uses of essential oils. Consult a knowledgeable reference for indications and contraindications before use. Keep out of the reach of children.